The emergence and early application of reduced port laparoscopy requires comparison to current accepted safe standards of multiport laparoscopy (MPL). Evaluation of single port access platforms with attention to ease of use and limitations is necessary. These new techniques introduce increased size (5- 20mm) or number (1-4) of fascial defects at a single access point. Thus, evaluation of the single fascial insertion site is warranted in light of the potential for hernia development. We compare three access techniques (SPATM, SILSTM, and R-portTM) focusing on insertion, adaptability, and skin and fascial incisions at the access site. Using the porcine model, each access platform was inserted in the midline abdominal wall through a 2cm skin incision. The R-port was inserted through a 2cm fascial incision, using the introducer to place the internal ring within the abdomen. For the SPA technique, soft tissue flaps were elevated from the fascia, a central 5mm trocar and two very-low profile 5mm trocars were inserted in a triangulated fashion. A trasfascial grasper was placed inferiorly within the incision. The SILS device was inserted via a 2cm fascial incision using a Kelly to compress the foam trocar. Three 5mm channel trocars were placed through the device. Operative maneuvers mimicking procedures were performed in all quadrants. Each access platform was removed and skin incisions measured. The skin was opened to evaluate the fascial defect. Closure of the skin permitted abdominal reinsufflation to allow for internal evaluation of the fascial defects. The R-port insertion was the fastest and performed by one operator. The SPA technique required an operator and assistant for insertion. The SILS device took the longest but was inserted by one operator. Exposure of the fascia in the SPA technique allowed for insertion of a fourth instrument. The R-port allowed insertion of a fourth instrument at the perimeter with retraction of the skin, but motion became limited. The SILS port did not allow fascial exposure for the addition of another instrument without extending the incision. Internally, instruments exited the R-Port and SILS port in line, precluding triangulation. The SPA technique demonstrated triangulation with 4-6cm distance between individual trocars at the abdominal wall. Upon removal of all devices final skin incisions remained 2cm. Further evaluation of the fascia demonstrated the defects were markedly different from internal and external views. External/internal fascial defects for the R-port and SILS were 3.5cm/2.5cm and 2.5cm/4cm respectively. The SPA technique demonstrated no change. Emerging techniques and access devices for reduced port laparoscopy must be evaluated to ensure safe, acceptable outcomes. Access site hernias are a potentially new complication. 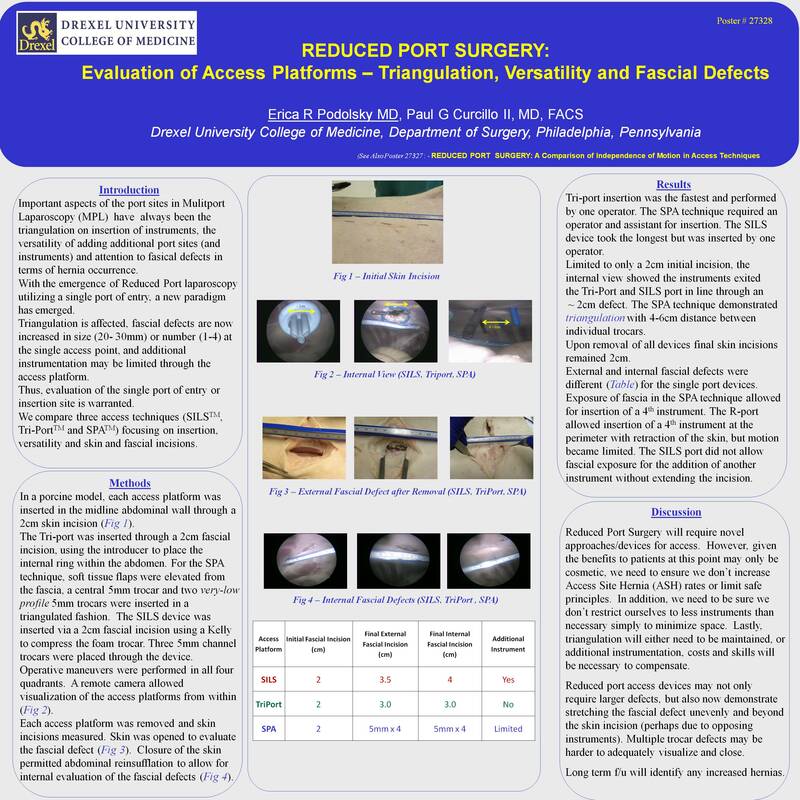 The single port access devices not only require larger defects, but also now demonstrate stretching the fascial defect unevenly and beyond the skin incision. Conversely, the multiple trocar defects may be harder to adequately visualize and close. The long term potential complication of umbilical hernia needs to be determined. Finally, evaluation of the skin and fascia on a histological level will be important to determine tissue weakening effects of these platforms.